It’s the season for fall festivals, and all across Georgia, artists are setting up booths featuring fine art and artisan crafts. As an artist, I love to explore these festivals, seeking inspiration as well as unique gifts for friends and family. One of the best things about visiting art festivals as opposed to a shop or online store is the opportunity to meet the artists and craftsmen face-to-face. As with any social setting, there are unwritten codes of courtesy that should be followed. In order to get the most out of your art festival experience and engage with the artists in a positive way, take a look at these excellent art festival etiquette tips from Vlasic Studio. Before you learn the do’s and don’ts of art festival etiquette, it’s important to understand some basic things about artists. Never forget that artists are people with feelings, just like you. It takes guts to create something from the heart and then put it on display to be critiqued by others. Artists have often spent many years learning a technique or earning a degree, as well as a lifetime continuing to hone their skills. A piece of art is not just the result of a few hours of work; it is borne out of years of experimentation and practice. The life of an artist is hard work. Artists do not get regular paychecks, benefits, and job security. They work 50 to 60 hours a week, not only creating their art, but also taking care of marketing, bookkeeping, sales, packing and shipping, and all the other logistical concerns of running a small business. 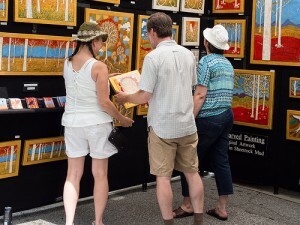 Attending art festivals and craft shows is expensive and takes a lot of work. Artists and artisans pay to be considered by a jury, they pay a booth fee to sell at the event, and they pay to travel to the event, not to mention the 10-12 hour days of standing in an outdoor tent with limited ability to take bathroom breaks or grab a bite to eat. Being an artist is a job, not a hobby. No matter how much an artist enjoys her work, no matter how passionate she is about it, making art is still work and deserves to be compensated as such. With all that in mind, there are some things you should never, ever say to an artist or craftsperson at a festival. “Can I get a discount?” An art festival is not a flea market, and as mentioned above, the artist has taken a financial risk to attend. Attempting to haggle with an artist is usually considered highly insulting. “My child could paint that!” “Who would ever buy that?” or any other insulting remark Obviously people have different tastes, and it’s fine if you don’t particularly like an artist’s work. However, openly expressing your distaste in front of the artist is incredibly rude and unnecessary. Artists go through a lot of stress and hassle to participate in festivals, so if you don’t like the work, at least do them the courtesy of keeping that opinion to yourself. All these rules are not to discourage you from interacting with the artists at your local fall festival. After all, that’s the beauty of buying art in person! Artists are usually very friendly folks who love to discuss their work with visitors. These are some questions and comments you should never hesitate to say to an artist or artisan. You can’t go wrong with a sincere compliment. It’s also just fine to appreciate the art in silence. Have you ever purchased art from the actual artist? What is your favorite art or craft fair in Georgia? Let us know in the comments or on Facebook! Thanks for using me and my artwork in your article! Our pleasure, your work is lovely! We have added a link to your website. I enjoyed reading this, Kass. Thanks for enlightening folks. I’m hoping to do some of these festivals you wrote about in the Atlanta area in 2015. I think i must develop a thicker skin first? Yep, probably so.